At Liberty, we make it simple. As a Liberty distributor, you'll get the fuel you need, when you need it, at a competitive price—all without red tape or bureaucracy. It takes a dedicated team of professionals to deliver this level of performance. We're constantly monitoring market developments, strengthening our supplier relationships in key areas of the country, and using Liberty's collective buying power to negotiate from a position of strength. Thanks to our volume, we can guarantee refiners a ratable lifting. In return, we can secure for our distributors favorable formula pricing tied to market indexes. Essentially, as a distributor with Liberty, you gain the services of a professional fuel buyer dedicated to your business. With Liberty, you know exactly what you are going to pay, day in and day out, and you know why. We offer favorable formula pricing tied to market indexes. "Pricing is key to survival in retailing gasoline and diesel, and Liberty is competitive everyday. Their program has always allowed me to maximize my profits while offering a top quality product." 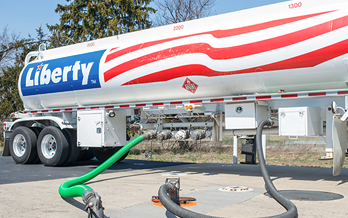 "For a marketer looking at private-branded fuel, Liberty offers a convenient method to enjoy the economies of volume fuel purchases."